A digital piano is an electronic instrument that requires a power supply, is equipped with a standard piano keyboard, and which is capable of reproducing the sound of a traditional acoustic piano as well as other sounds thanks to electronic sound sampling technology. - It can be programmed to generate various types of sounds simulating various instrument tones ( such as piano, strings, organs, etc.). - Being much lighter than an acoustic piano, it can be moved around more easily. - It provides the ability to play with headphones so that no one else is bothered. - It can be connected to a computer allowing various functions such as downloading played pieces of music from the piano to the computer or uploading music from the computer to the piano. - It will never need an expensive piano tuner to be called for tuning the piano. - It allows adapting the keyboard to the player's playing ability and style. The main disadvantage of a digital piano is that the sound can never be as full and nuanced as the sound emerging from a traditional acoustic piano. However, when one considers the best digital pianos available today, unless it is played in a special and acoustically engineered environment such as a concert hall, the difference in sound quality is almost imperceptible. And for home playing purposes, the best digital pianos that you can buy nowadays are definitely worth considering, specially when you keep in mind the advantages listed above. Given the multitude of models offered by different manufacturers, choosing a digital piano can be tricky. Indeed, the different brands and models will have a wide variety of features. In this article, you will find a detailed comparison of the two best selling digital pianos on Amazon at the time this article was written. They are the Yamaha Arius YDP162 and the Casio Privia PX850. These two pianos are not only very popular, but have also received raving Amazon customer reviews with 4.5 and 5 star ratings (out of 5 stars). Otherwise, continue reading below for a detailed comparison of the Yamaha and Casio digital pianos. The following pictures show the selected digital Pianos. Following the pictures, you will find a detailed comparison table to help you choose the best digital piano that will respond to your family's needs. Please read carefully the Table Notes which explain in detail the features supported by the compared Yamaha and Casio digital pianos. The specified height does not include the music stand/rest which could be an additional 6 to 8 inches. Graded (or Weighted) Hammer Action means that the keys of the electric keyboard are weighted to simulate the feel of a real piano. Graded Hammer Action requires heavier weights toward the bass end and lighter weights toward the treble end of the keys, which more closely resembles how an acoustic piano feels and sounds. Both the Yamaha and Casio digital pianos chosen here for comparison come with this feature. Touch Response (or Touch Sensitivity) is how the piano sound responds to the way the keys are played. Most digital pianos offer various types of keyboard touch sensitivity settings. These are also known as “velocity” sensitivity settings and can help the player adjust the keyboard to his or her playing style. Yamaha Arius YDP162 provides 4 settings for touch response (Hard,Medium,Soft and Fixed). Casio Privia PX850 provides 3 levels of touch response (1,2 and 3). The Record feature found on the selected Yamaha and Casio digital pianos is a great way to capture a performance and play it back to hear your progress. Both the Yamaha and Casio digital pianos are equipped with two tracks for recording. This means that, when playing a piece of music, you could record the left hand music to one track and the right hand music to the other track. This is a useful feature as it will allow you to practice one hand, while your piano plays the other. You could also record to each of the two tracks different versions of the same song using different voices and effects and then play both tracks together for surprising results. Note that for a given piece of music, both tracks can be played at the same time, and you can also turn off one track and play back just the other track, if desired. Any recorded music on either track can easily be deleted when not needed anymore. In general, digital pianos record the music to built-in memory, but when the piano is equipped with a USB port, music can also be recorded to and played back from a USB flash drive or a USB connected computer (please refer to Note 5 for more info on USB interfaces on these pianos). MIDI (short for Musical Instrument Digital Interface) is a technical standard that allows electronic musical instruments such as digital pianos, computers and other related devices to connect and communicate with one another. When a piece of music is played on the digital piano, the MIDI interface in the piano is able to encode it using the MIDI protocol and send it over to the computer where it will be decoded and used for various purposes. Conversely, a piece of music encoded using the MIDI protocol can be transmitted from a digital device such as a computer to the digital piano for storage or for play. The USB port on the digital piano allows you to connect the instrument directly to your computer. When thus connected, the piano is recognized as a “USB Audio device” and is able to receive and transmit MIDI messages through a single USB cable (i.e. MIDI In/Out via a single USB port). Note that some pianos will have explicit MIDI input/output ports as well as a USB port that can be used for MIDI messaging. Others will have only a USB port that can be used for MIDI messaging. Yamaha Arius YDP162 is equipped with a USB port that can be used for MIDI messages transmission. There are no explicit MIDI input/output ports. Casio Privia PX850 is equipped with a USB port that can be used for MIDI messages transmission. There are no explicit MIDI input/output ports. Note that the Casio piano is also equipped with a USB Flash Drive port. Polyphony is the maximum number of simultaneous voices that a digital piano can generate. If a digital piano has a low level of polyphony, then some voices may be abruptly cut off when you use the sustain pedal while playing complex chords. If, as a beginner, you don’t want to pay too much for the piano, you will not really need a high polyphonic digital piano. However, as you progress, you will eventually start playing more complex pieces of music, and higher polyphony may become important to you so that your digital piano can respond to your skill level. With 256 voices, the Yamaha Arius YDP162 offers the highest level of polyphony, while the Casio Privia PX850 offers 128 voices. The number of voices represents the number of sounds (or instrument sounds) that the digital piano can simulate. Yamaha Arius YDP16B can simulate 10 voices: Grand Piano1, Grand Piano2, Grand Piano3, Electronic Piano1, Electronic Piano2, Harpsichord, Vibraphone, Pipe Organ, Jazz Organ, Strings. Casio Privia PX850 can simulate 18 voices: Grand Piano (5 modes: Concert, Classic, Modern, Mellow, Bright), Electronic Piano (3 modes), Harpsichord, Vibraphone, Strings 1, Strings 2, Pipe Organ, Jazz Organ, Electronic Organ (2 modes), and Bass (2 modes). Layered mode allows layering two different voices (instruments) and play them simultaneously to create a more richly textured sound. Note that both pianos considered here allow the layering of only two distinct voices. Duet mode splits the keyboard into two equal ranges, allowing two people to use the piano simultaneously. The Reverb effects simulate playing in a room or hall where the sound reverberates off the walls and ceiling. Digital pianos provide a number of selectable Reverb levels that correspond to different room or hall sizes. The Chorus effect adds depth and width to the selected keyboard voice. Usually when a particular voice is selected on the piano, the appropriate effects will turn on automatically. But they can be modified if desired. Yamaha Arius YDP162: There are four Reverb levels (room/ hall1/hall2/stage) that add extra depth and expression to the sound and create a realistic acoustic ambience. Here there is no separate Chorus effect to select. The appropriate Chorus effect level gets automatically integrated into the selected Reverb level to provide the sound with the required depth. Casio Privia PX850: There are four Reverb levels (room/ hall1/hall2/stage) and four Chorus levels (light/medium/deep/flanger) that are explicitly selectable. The Transpose feature can shift the piano’s pitch up or down in semitone intervals. Yamaha Arius YDP162 supports transpose of (-6 0 +6). Casio Privia PX850 supports transpose of (-12 0 +12). Both pianos come with preset songs saved in the digital piano’s memory that you can play back. Yamaha Arius YDP162 comes with 10 demo songs and 60 preset songs. Casio Privia PX850 comes with 60 preset songs. The preset songs of both pianos have separate left-hand and right-hand parts that can be turned on and off as required so you can practice the corresponding part on the keyboard. The three pedals are for Sustain, Sustenuto and Soft play. Pressing the Sustain pedal while playing will cause the notes you play to reverberate for a long time. Releasing this pedal immediately stops any sustained notes. Pressing the Soft pedal while playing suppresses notes played on the keyboard after the pedal was pressed, and makes them sound softer. The notes played before this pedal is pressed are not affected. Pressing the Sostenuto pedal while holding the notes will sustain the pressed notes (as if the Sustain pedal had been pressed), but all subsequently played notes will not be sustained. This makes it possible to sustain a chord or single low note, for example, while the other notes are played “staccato”. Connecting headphones to either of the 2 headphone jacks cuts off output to the speakers, which means you can practice even late at night without bothering others. In piano jargon, beat represents the number of “ticks” that correspond to each bar (or measure) within a particular piece of music. For instance, a beat of 3 (also written as 3/4) corresponds to the Waltz beat, and is the equivalent to 3 “ticks” per bar (1-2-3 / 1-2-3/ 1-2-3/etc.). Tempo is the number of beats per minute (bpm) played. A metronome is a device used to set the beat and tempo of the musical piece played. Yamaha Arius YDP16B supports 6 distinct beats and the tempo range of 5 bpm to 280 bpm. Casio Privia PX850 supports 6 distinct beats and the tempo range of 20 bpm to 255 bpm. Each of the two Yamaha Arius YDP162 speakers is equipped with a 20W amplifier. Each of the two Casio Privia PX850 speakers is equipped with a 20W amplifier. When you buy a Yamaha Arius YDP162 the bench is included. When you buy a Casio Privia PX850 usually there is no bench included. But bundled Casio Privia PX850 offerings, including a bench, can be found on Amazon (see Amazon product section below). For the Yamaha Arius YDP162, the Auto Power Off time is 30 minutes. For the Casio Privia PX850, the Auto Power Off time is 4 hours. So which of these two pianos to buy? When comparing the Yamaha Arius YDP162 and the Casio Privia PX850, the first thing to keep in mind is that Yamaha is first and foremost an acoustic piano maker (including acoustic grand pianos). It therefore has a lot more experience than Casio in creating the acoustic piano sound, and hence one would expect Yamaha to be able to simulate the acoustic piano sound more successfully than Casio, which is indeed the case. However, unless you are playing in a room specially designed for acoustic sensitivity and responsiveness (such as a concert hall), the difference in acoustic piano sound simulation between the Casio PX850 and the Yamaha YPB162 is almost imperceptible. 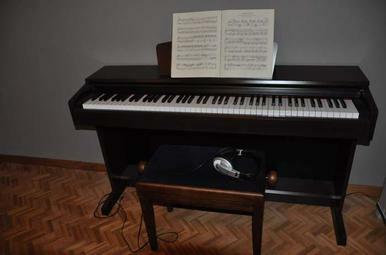 Therefore, given that, as shown in the comparison table above, both pianos come with all the important features digital pianos are supposed to have, and that the Casio costs about $500 less than the Yamaha, for home playing, the Casio Privia PX850 remains also an excellent alternative to the more expensive Yamaha Arius YDP162. Note however that a bench is not always included with the Casio PX850, but bundled Amazon product offerings that include the bench are also available (see Amazon products section below). Please click the piano of your choice below for exact price information or to purchase. Yamaha Arius YDP162 comes with the bench and is available here in rosewood color. Casio Privia PX850 does not usually come with the bench, but a bundled offer that includes the bench is also available (see below). The piano is offered in ebony color. Yamaha has more recently produced a new version of the YDP162 piano in the Yamaha Arius series: the YDP163. It is equipped with a GH3 keyboard vs. a GH keyboard for the YDP162. GH3 keyboards have better accuracy and feel than GH keyboards, but the really great thing about the GH3 keyboard is that it provides three sensors per key as opposed to the two sensors per key in GH keyboards. This means that unlike with most digital pianos, the three sensors will allow you to play a note repeatedly in real fast succession (this is something that can be done on a grand piano with ease). It provides polyphony of 192 notes vs. 128 notes for the YDP162 (for an explanation of polyphony, please refer to Note 6 above). It consumes slightly less power: 12W vs. 13W for the YDP 162. It comes in Black Walnut or Dark Rosewood. 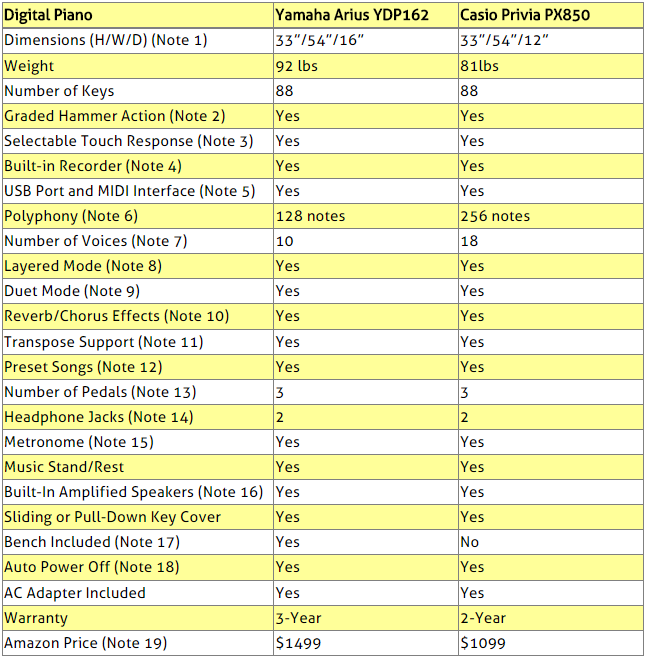 ​The rest of the Yamaha YDP163 features are the same as YDP162 as described in the comparison table above. ​Casio has more recently produced a new version of the Privia PX850 piano: the PX860. PX860 is similar to PX850 with regard to cabinet design, control panel, internal sound system and the various functions it provides. But there are some improvements to the actual piano sound and the various instrument voices that it reproduces. There is also a new reverb setting which generates the sound you would hear in a large concert hall where there is natural echo. In addition, high-quality audio recordings of 10 live philharmonic orchestra performances are installed. Pianists can play along with these recordings and enjoy the feeling of participating in a magnificent performance. Musical scores of the music are also included.